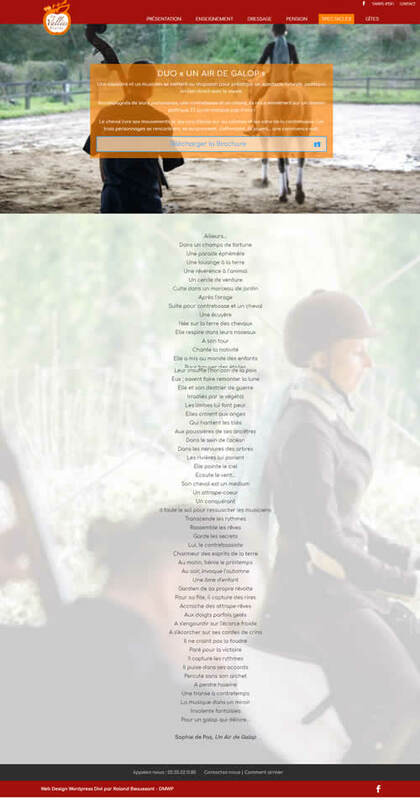 Complete redesign for Les écuries des vallées, Riding school and center, dressage, horse shows, pensions et horse psychology in Normandie, Seine-Maritime, near Rouen, Buchy, Forges-Les-Eaux. Creation of a custom WordPress structure with the visual editor divi. Big work on the company’s photos and philosophy, in collaboration with its funder Sophie de Pas. PRICING FROM 600€ tax excl. ! Describe your Website project in a few words or simply leave us your contact details and we’ll get in touch.